(Chicago, IL) — July 13, 2010. It was nice while it lasted. Governor Pat Quinn on Tuesday stretched his executive authority—along with his goodwill with Illinois lawmakers—and rewrote legislation to eliminate the requirement that Illinois residents must declare a party affiliation when voting in a primary election, and in doing so likely guaranteed its doom. “This bill is an important step towards making our primary elections fairer and more competitive, but it does not go far enough,” said Quinn, explaining the gubernatorial fairy dust sprinkled on the bill. Under current Illinois law, a voter must declare a party affiliation before voting in the primary, which is then recorded as a public record. Quinn’s “open primary” plan would change that. “We cannot allow party affiliations to stand in the way of meaningful choice. Today’s action will protect the privacy of voters’ party preference and encourage greater participation in primary elections,” said Quinn. However, the original House Bill 4842, which was sponsored by House Majority Leader Barbara Flynn Currie (D-Chicago) and State Senator Martin Sandoval (D-Chicago), only required the Illinois State Board of Elections to produce an Internet voters’ guide prior to the primary election. That’s it. In effect, the Governor wrote a new law. That type of gubernatorial of overreach is considered a no, no by a legislature which zealously guards its lawmaking authority granted by the Illinois Constitution. 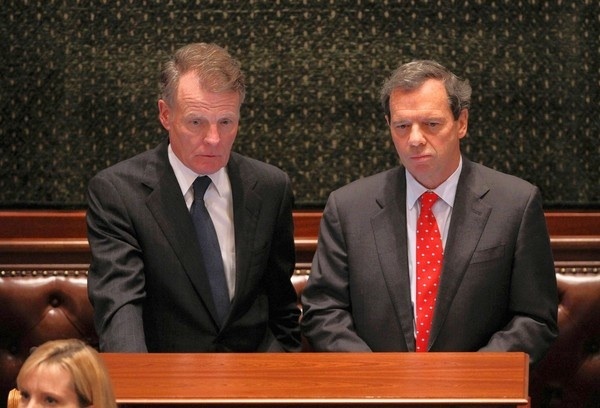 Quinn’s action provoked a terse response from Steve Brown, the spokesman for House Speaker Michael Madigan (D-Chicago). Brown said Quinn’s bill rewrite is “under review”. Translation: it’s fish food. Meanwhile, House Republican Minority Leader Tom Cross (R-Oswego) stuck up for Quinn in order to stick it to Madigan. However, Capitol Fax publisher Rich Miller noted that the idea of cloaking a voter’s identity has been found unconstitutional by the U.S. Supreme court, trashing the “right-to-privacy” idea. The specific privacy interest at issue is not the confidentiality of medical records or personal finances, but confidentiality of one’s party affiliation. Even if (as seems unlikely) a scheme for administering a closed primary could not be devised in which the voter’s declaration of party affiliation would not be public information, we do not think that the State’s interest in assuring the privacy of this piece of information in all cases can conceivably be considered a “compelling” one. For Quinn’s legislative action to become law, both chambers of the Illinois General Assembly must approve the changes. If the legislature declines to approves the changes, Quinn’s gambit dies. Cullerton’s stress on “compliance analysis” hints at the fate of the governor’s proposed open primary. Death. Quinn, who has long backed an open primary system in Illinois, will likely be unsurprised. The governor, who failed to raise the measure during the regular spring legislative session, has cultivated no lawmaker support. Zilch. Quinn’s populist gesture–and it’s only a gesture because its chance of becoming law is zippo–was splashed, for example, approvingly on page one of Wednesday’s Chicago Sun-Times. However, by Thursday, it was fish wrap.